I'm going!! BamaDave from Mobile will convoy with me. Leaving Thursday evening. Driving scenic route up over two days. BMT is Saturday and we will drive straight back Sunday. This is a great drive with great people. Video from last fall below. This Fall Boston Mountains Tour 2014, 1 November, will be the 16th one we have run. If you have not yet participated in a BMT with your S2000, you have missed great fun and the opportunity to meet BMTers from 6 or 7 nearby states. These spirited driving events have never been limited to only Honda S2000 or NSX cars. We have had Porsche, BMW, Ferrari, Aston Martin, Viper, Corvette, WRX GTI, and other performance sports cars run with our S2000 roadsters. There is never a registration fee to join a BMT; come join us and drive your S2000 or other sports car how it was made to be driven! The Fall BMT'14 pre-drive for staff, group leaders, and sweep car drivers went off without a hitch. The leaves are turning here now and should have full color by 1 November. What a great BMT route is in store for the 1 November BMT event. 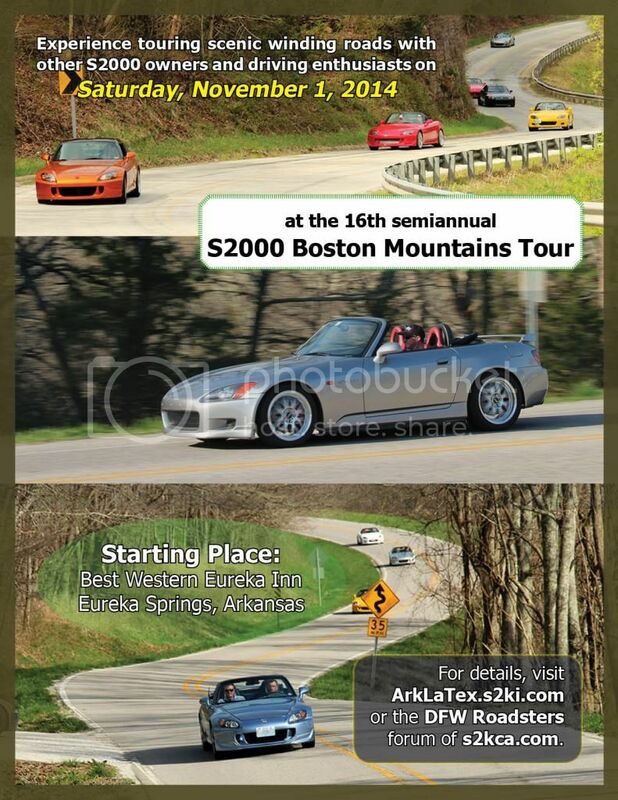 There is still room for a couple more sports cars to attend this spirited all-day driving event on the mountain roads of NW Arkansas. The local weather forecast for BMT weekend in Northwest Arkansas is: Friday-sunny, with high of 61 deg. F with a low Friday night of 36 deg. F. BMT Saturday: sunny, with a high of 62 deg. F with a low Saturday night of 45 deg F. Sunday-partly cloudy, with a high of 67 deg. F. This is the temperature range the BMT staff hope for as the cold temps discourage the slow driving motorcycle bunch from clogging the mountain roads.